Mostly Autumn this spring - yes, that couldn't be more appropriate for us sun-starved UK-dwellers this Spring. The British prog-rockers of Mostly Autumn, are hitting the road this month and next, fourteen years on, with eight studio albums under their belt, and as we speak, they are putting the finishing touches on their ninth effort, entitled 'Go Well, Diamond Heart'. The collective fronted by the enduring pair, Iain Jennings (keys) and Brian Josh (vocals, guitars and keys) boasts an impressive touring history which has seen them Netherlands-bound throughout April, before treating their domestic aficionados in May and June. 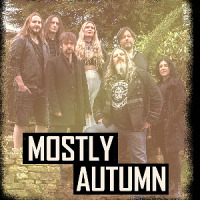 And so, Mostly Autumn will play in London this coming Saturday 15th, at the Shepherd's Bus Empire supporting Wishbone Ash alongside Panic Room, before heading to their tour-proper starting in Milton Keynes (21st May), Lincoln (22nd May), Southampton (2nd June) , Penzance (3rd June) , Exeter (4th June) , Frome (5h June) and Wolverhampton on 6th June. The band will then take part in - headlining (Sunday), even - at the Cambridge Rock Festival (5th-8th June), before taking to the York Grand Opera House in December. £12.50 to £15.50, regionally, £20.00 or £25.00 in London (depending on whether seated or standing) - plus booking fee. The band are also due to announce a London date all to themselves at the Shepherds Bush Empire for Autumn/ Winter... watch this space. Wed 30th Oct 2019 Big Big TrainBirmingham Town Hall (Birmingham)More Info..